Andrew Pinto was just weeks into his new role on the LCO Board of Governors in 2012 when he found himself citing the Commission’s report on vulnerable workers in a meeting with a client. 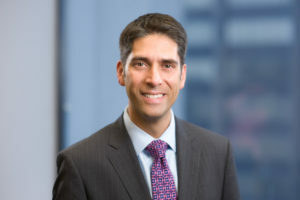 Those practical solutions, he says, can have real life consequences for all kinds of people, including the clients he serves as a partner at Pinto James LLP in Toronto, where he practices civil, employment and administrative law. One of Pinto’s first tasks as chair will be to lead the LCO through an active publication stage. Three of the four current projects will conclude in 2019. The Board will also continue to oversee new projects, including projects on lndigenous law and digital rights. Elman, who will serve one more year as past chair, is keen to see the LCO continue its legacy of deep, objective research infused with community consultation. But he’d also like to see more stakeholders and policymakers stand up and take notice of the Commission’s recommendations. The appointment of the LCO’s new board chair coincided with several additional Board updates and staff changes.